'A rigorous workout.' 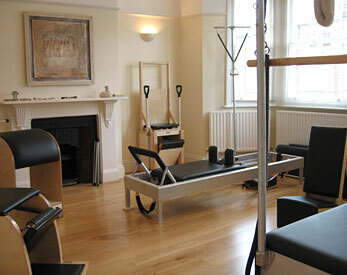 - Identified as one of the best Pilates studios in London by the Evening Standard. 'You may think you know Pilates, but a session in this beautiful studio may prove otherwise. Patricia's one-on one sessions will challenge you physically and mentally working the body all over...If your session does not make you sweat, you've probably been doing something wrong.' Identified as the best pre-bikini workout. Whatever your level of fitness or physical ability, get a REAL workout as was taught by Joseph Pilates and directly passed on to his chosen successor and protegee, Romana Kryzanowska (also a former Balanchine dancer). One of just a handful of teachers in the UK certified by the prestigious Romana's Pilates in New York; the highest quality apparatus built to the specifications of Joseph Pilates; delighful private setting; convenient location and OFF-STREET PARKING.